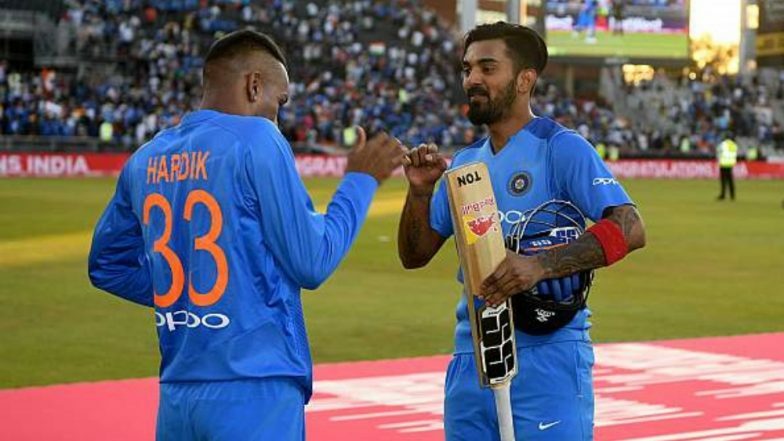 Board of Control for Cricket in India (BCCI) ombudsman DK Jain has said that he will soon announce the decision regarding the sexist comments made by Hardik Pandya and KL Rahul on famous celebrity talk show Koffee With Karan. Following the comments, both Pandya and Rahul were suspended from playing cricket. However, the suspension was later revoked. India’s Likely Squad for ICC Cricket World Cup 2019: KL Rahul Could Find a Place; Rishabh Pant, Dinesh Karthik Might Miss Out. While Pandya met BCCI ombudsman DK Jain on Tuesday, Rahul met him on Wednesday in Mumbai. Following the meetings, DK Jain has said he will take a decision soon. “Both KL Rahul and Hardik Pandya met me and explained themselves, in due course I will take a decision,” DK Jain told newsgathering agency ANI. Both Pandya and Rahul are currently participating in the Indian Premier League 2019 (IPL 2019). While Pandya plays for Mumbai Indians, Rahul is part of the Kings XI Punjab team. Interestingly, MI and KXIP will face-off for the second time this season at the Wankhede Stadium in Mumbai tonight. While Pandya is set to be named in India’s squad for the ICC Cricket World Cup 2019, provided he gets clearance, Rahul is fighting hard for his place. With few spots up for grabs, Rahul is competing with the likes of Dinesh Karthik and Rishabh Pant. BCCI Wants Hardik Pandya-KL Rahul Chapter to End With ICC World Cup 2019 in Mind. Rahul has been in good form in IPL 2019 thus far and has scored three half-centuries in six matches. After his suspense was revoked, Rahul featured in the ODI and T20I series against Australia.